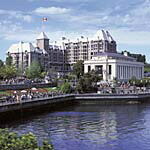 Built in the early 1900s by Canadian Pacific, the historic Fairmont Empress hotel has long been a favorite of visitors to Victoria. A gracious presence overlooking the Inner Harbour, the hotel amenities include an indoor pool, Internet & concierge services along with on premises shops and restaurants. 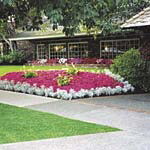 Adjacent to the Victoria Conference Center & close to superb shopping, the Empress is also pet friendly. Situated on the edge of the Inner Harbour only blocks from the heart of the downtown shopping, each room in the enormously popular Inn at Laurel Point provides a private waterfront balcony and complimentary high-speed Internet. With a fabulous restaurant on premises, an indoor pool & concierge services to look after guest needs this is a superb hotel. This 5 star Victoria property sits across the street from the Harbour, the ferry terminal and is only a block from the Provincial Museum and the start of spectacular shopping. The Royal Scot is especially popular with families, those who prefer a little more space in their room and those spending a few days in Victoria - in part, because the Royal Scot rooms have kitchenettes in spacious rooms. The property also boasts a pool, Internet, free parking, and an on premises restaurant. With a big bowl of apples at the front desk, there is always a warm guest welcome. An historic property, the Hotel Rialto rooms provide guests with fridges, microwaves, flat screen TVs & free Wi-Fi. The Veneto Tapa Lounge serves coffee, cocktails and cafe fare. 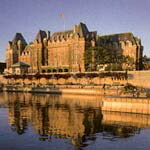 Built in 1911 this historic building is located minutes from the Inner harbour and provides an affordable stay in downtown Victoria. Updated with all the modern conveniences the James Bay Inn provides their guests with concierge services, bike storage, an on premises restaurant & pub.